where each item row is like the one shown above. Let’s analyze this class. In the constructor we reference the new layout calling super constructor. The next step is to update the view with the right information. Let’s suppose we have only the Planet name and the sun distance (in our case is just a fake value). So we use findViewById in the layout, we inflated before, to get the reference to the view we want to update and then simply set the new value. 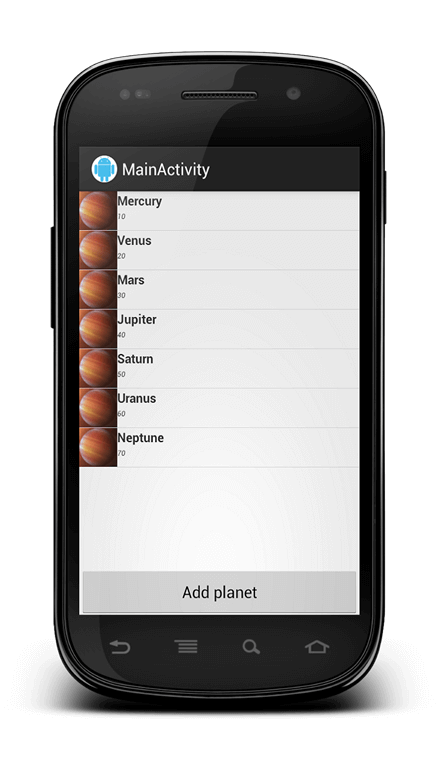 Well, I didn’t use the right images for the planets it is just a way to show you how to use images!!!. You have to resize and make the images better in your app! Now if you click on an item you get a ClassCastException. Why? Well, you try to cast, inside the onItemClick method, a RelativeLayout to a TextView and it is impossible. 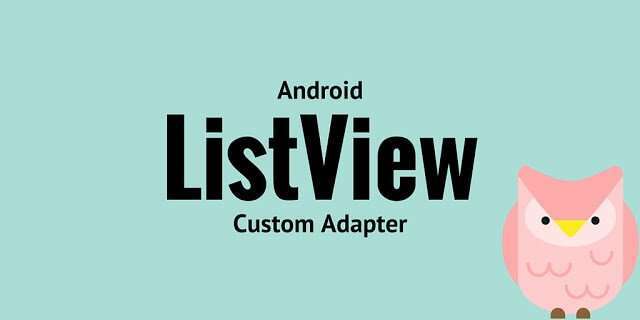 This tutorial describes how to use Android ListView with checkbox. This is an important component and it is widely used and has many applications in different fields. In this post, i want to show how to use ListView with Checkbox so that user can select items and give you some tricks to handle some problems. 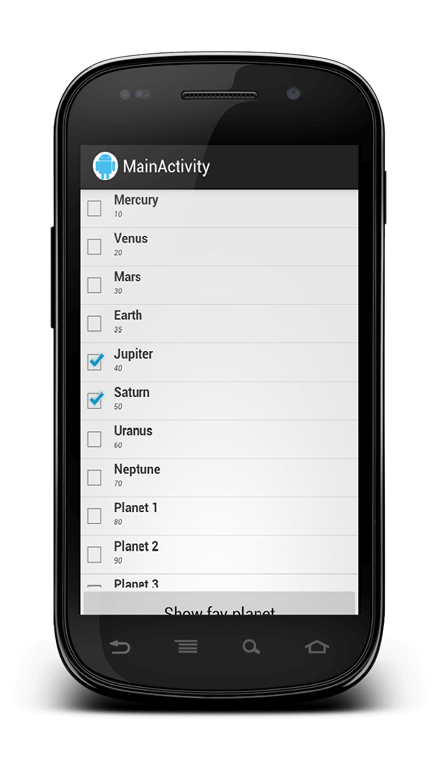 At the same time, we want to handle user click so that we keep track of items checked and give access to the item menu. Once we have our layout, we use it in our Adapter. 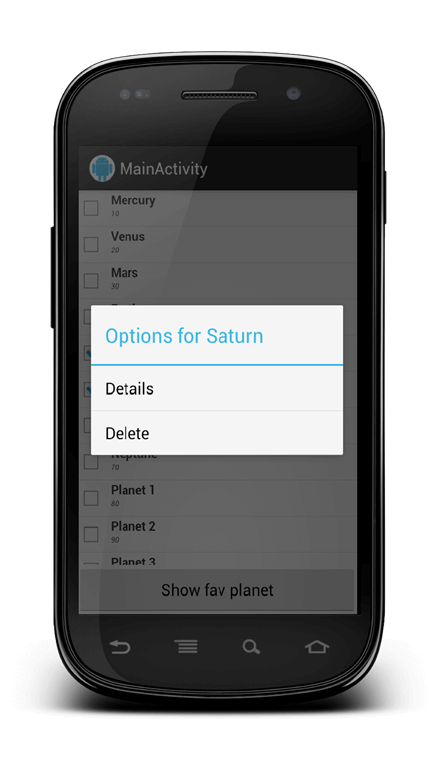 As discussed in other post we have to modify our getView method so that we can handle the checkbox. The code is very similar to others used in other post, we simply need to get the reference to the Checkbox component and handle it. In the last line, we simply define the listener invoked when a user clicks on the Checkbox. Java purists can discuss if it is better to implement the listener directly inside the adapter or somewhere else (MainActivity in our case). 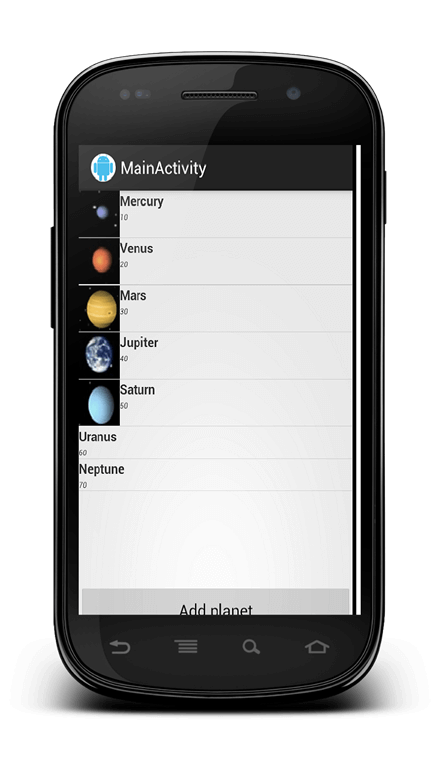 Well in my vision the adapter should be used just for filling the ListView, so that MainActivityclass is my opinion should the one that handles user touch interactions. The onCheckedChanged method is invoked when a user clicks on the checkbox. In this method, we handle the event, finding first the position or in other words the item position inside the ListView. 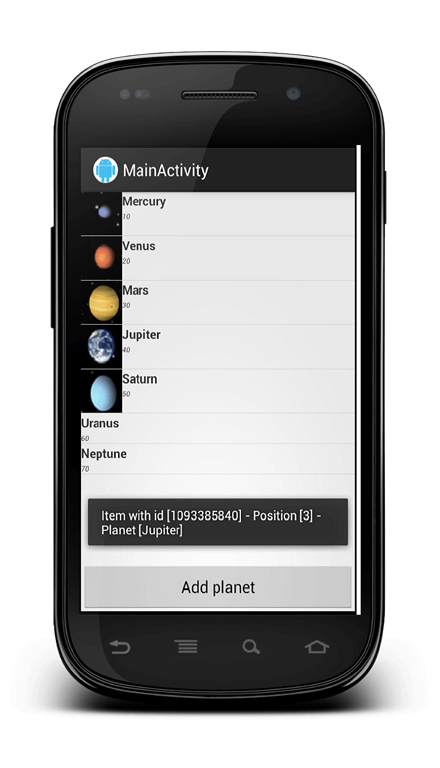 Then we verify that this position is valid, comparing it against ListView.INVALID_POSITION and if everything is ok we set the boolean attribute of the Planet class the the isChe parameter value. If you “play” with the app you could notice some strange behaviors. It crashes!! !…Yes right. Awesome blog ! !Following it now.Amazing way of writing and explaining technical topics. can you give to me an example about your xml with multiple layout? Thank you very very much!! It's been hours that I search for this kind of easy understanding sample. Now I understand what I do instead of just try copy paste code! when convertView is not null. You are right. I will modify the code..Thx for your support! Where did you define "Planet" class? 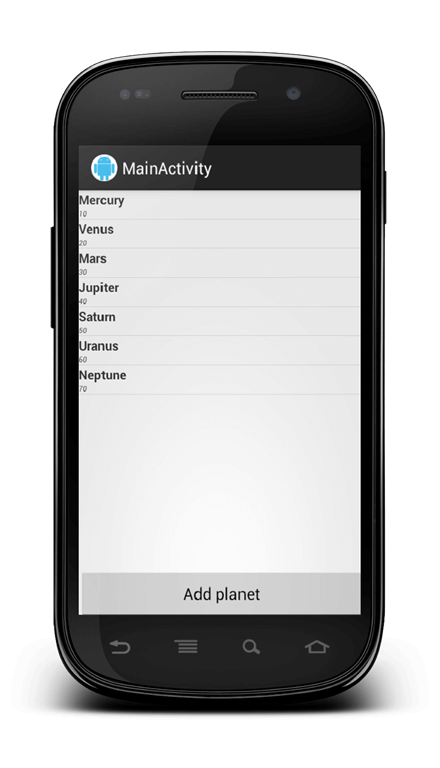 To something that call for Planet adapter constructor but I didn't manage to do that the right way. Can someone explain? i search so many times, but not getting relevant information about my problem. my question is list view have more than 1 row. each row contain 1 image view 1 text view. when user click on row. image should be changed..! i need your valuable guide. Share this blog to your friends! !